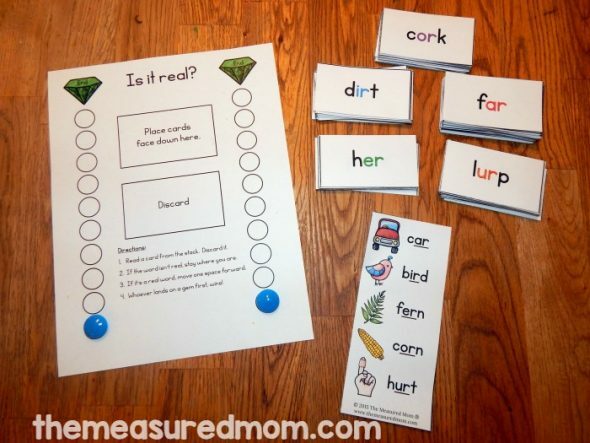 Looking for a fun activity to help your child master those tricky words with r controlled vowels? Try this free game! Now that my early reader has mastered CVC words, it’s time for the next step. 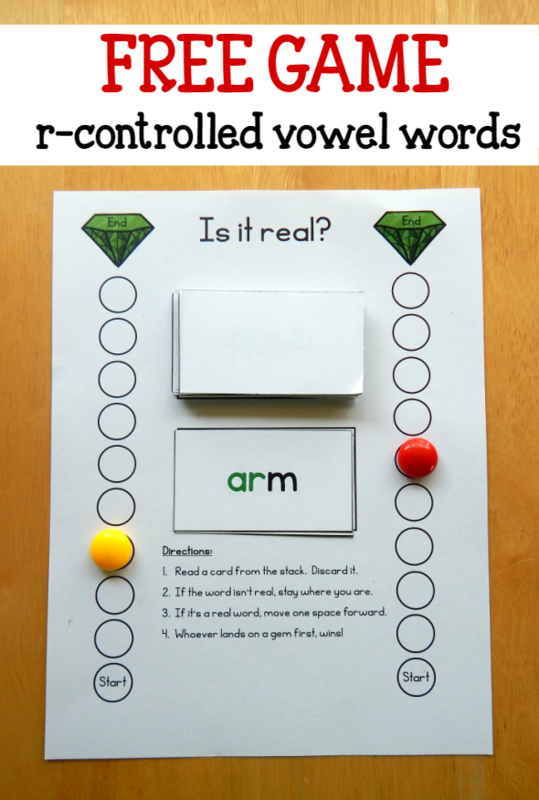 I decided to move to the next phonics pattern that’s introduced in my free phonics books: words with r- controlled vowels. These are just plain tricky! It can be hard for new readers to keep ar, ir, er, or, and ur straight. The prep for this game is super simple. Print the “Is it real” game board and playing cards. Choose the r-controlled vowel you would like to work on. You can also print the free picture bookmark as a reference (stay tuned – that’s coming soon!). Put the stack of cards face down on the board. Take turns drawing a card. Read it aloud. Is it a real word? If it is, move your playing piece up toward the gem. If it’s not a real word, stay where you are. At first my son had a hard time with this pattern. For the word “cart,” for example, he read “crat.” But with lots and lots of patient practice, he had it by the end! A few days later, we pulled the game out again. He still remembered the ar pattern – hurray! Now it was time to work on the others. We played a review game of ar, one with ir, and one with ur. After that he’d had enough for the day. It’s low prep. Just print the game board and the cards you’d like to use. Cut apart the cards. It’s quick. A single game takes about ten minutes. New readers need quick games, as they tend to tire easily. It provides a lot of phonics practice. The tricky thing with r-controlled vowel words is that there aren’t that many real words to practice. For example, how many one-syllable er words do you know? Herd. Fern. Not too many more. When you mix it up with pretend words like perg and wert, you get in a lot more phonics practice. A few giggles, too! It’s a vocabulary builder. When your child has to think about whether a word is real or pretend, he has to think about the word’s meaning. When you play with your child, you can tell him the meanings of unfamiliar words. (Not too many new readers know the word mar, for example.) Of course, when kids are playing together, neither one might know that a particular word is actually real. No problem. As long as they’re getting practice pronouncing that tricky pattern! Get your free games in color HERE. Want to keep all those vowel patterns in black and white or just print a black and white game board? Get your free games in black and white HERE. This is our first year homeschooling and my little guy has really hated reading and LA in general. Then I found you! I really cannot adequately say how your ideas and brilliant games have made our days so much more enjoyable. Now we can honestly say learning is fun! Thank you! Oh this fabulous! I’ll be printing and prepping this weekend ready for next week. Thank you. You’re welcome, Kylie – I hope you enjoy it! Thank you Anna. I am a teacher who works with all age children who have Learning Difficulties, and I cannot tell you what a great resource you are. With your word family books, you have filled a great need. 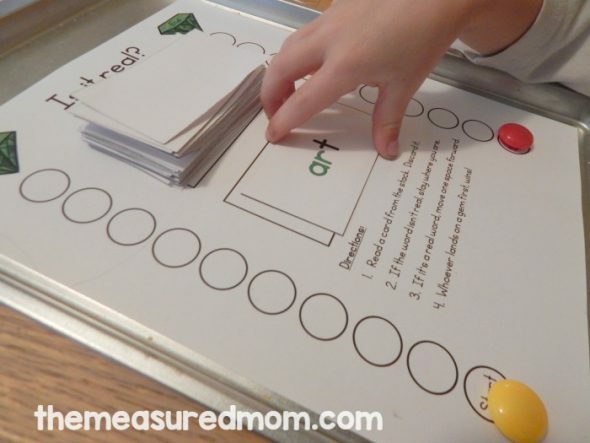 I have found many children get overwhelmed; after teaching segmenting and blending for short vowels individually, then moving them onto decodable books, it can just be too big a hurdle to jump. 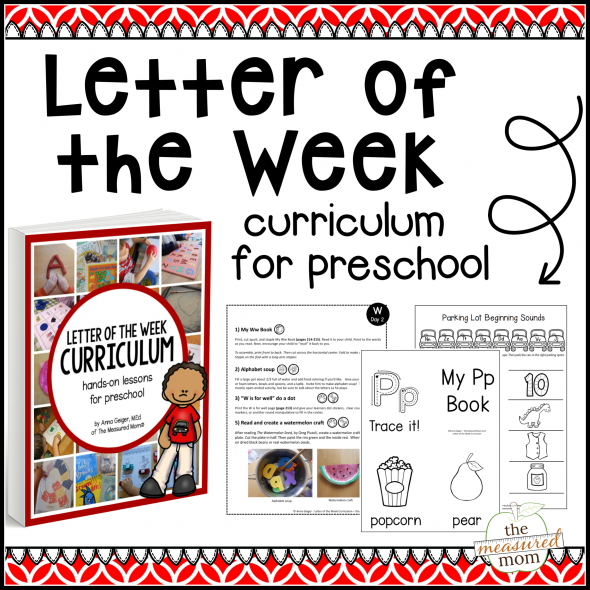 With the word family books, this smooths their passage into decodable books and teaches important sight words as well. A wonderful resource! I am from New Zealand, and I am recommending your site to many of my teacher friends!! I just found your site. Wish I had know about this all year long. I teach second grade, and while not all of my kids need this, my lower or struggling students will benefit greatly from this. I also shared your site with our Kindergarten teachers and special Ed teachers. They are going to love you too. I’m so glad you found my site, Kathi! Hopefully you’ll be able to use some of the resources with incoming students in the fall. Thank you SO much for passing it on to your colleagues! I included a link back on a blog that I have as this was a very clever game and although I would use it for speech sound production the game and the list of words would be the same. Thanks for your work. I love your site and all the freebies! 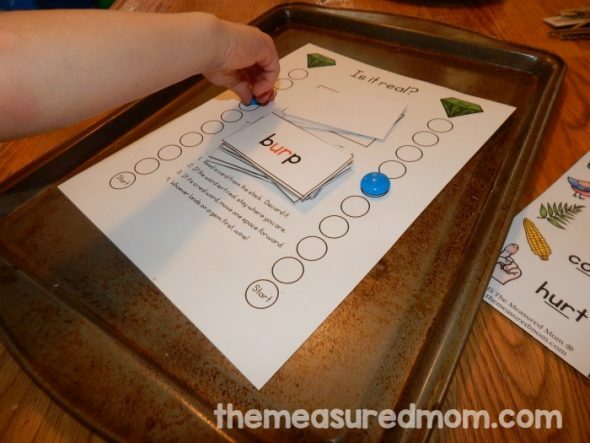 I am a teacher who does a pull out program for stuggling readers so I’ve used a lot of your activities and the students keep telling me how much fun they have in my class when I pull out your games. Their favorites are the clothes pin activities. With that in mind, I’d like to ask if you could do a clip it activity with bossy r words. The er, ir, and ur words are especially difficult for them to spell correctly. I’m working with students from grades K through 7 so many of them are decoding while others need to spell the words in addition to reading them. Thanks so much for this site! Hi Judy! I’m not sure if I’ll have time to make this set (we’re getting ready for baby $6), but I’ll put it on my to do list and leave a comment here for you to see in case I get to it. SO glad to hear that your students like my games! Congrats on number 6! I’ll be patient ? 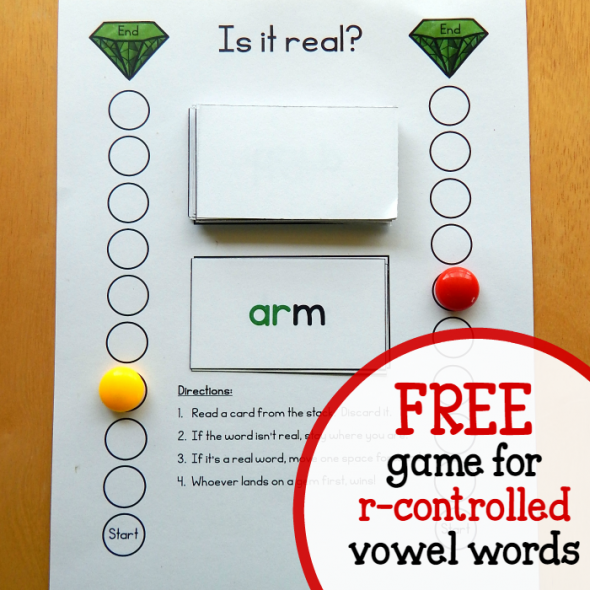 I’ve tried several times to download your free game for r- controlled vowel words, but have had no success. Is there a problem there. I have no rouble downloading other games/materials from other websites. Daily i used to browse your website. i could get more idea and following your game ideas and other printables i make it for other subjects also. Really thankk you for your service. my son has just has started recognising cvc words and can write them if i pronounce it to him still in reading cvc words he gets stuck sometimes , so is this the time to introduce R controlled vowels or should i stick to making him go properly through cvc writing and reading both ? I would wait until he’s reading CVC words automatically. The r-controlled vowel words are quite a bit tougher. You have amazing materials! Great job!!! I had an experience the other day that taught me I need to be more careful about asking in a word is “real”- especially with those students whose home language isn’t English. I asked a chld if a word was real, expecting to hear the answer no as it was not an English word. The child answered yes and explained it was a word in their home language. Great point! I wouldn’t recommend this game for English language learners. Thank you, thank you, a thousand times thank you. My 72 year old adult literacy student was tested on a low third grade reading level. I can use your material as is, or it is easy to adapt (so it doesn’t seem so childish to her). Thank you so much for these wonderful games for my students. I am going to share your name and logo on my blog. You’re very welcome, Philicia! Thank you for recommending me!